Incomplete or improper surface preparation. Improper fittings around house (ie. failed caulking) permitting moisture to seep into openings. Poor quality paint or improper mixing of paint. Our technique maximizes materials and minimizes labour. Ease of application - goes on well with excellent coverage using less labour to apply and uses less paint. Durability - holds up well to through cleaning and lasts longer. Safety - using gloss paint maximizes light reflection and brightens up the interior of the garage. Our process is different for each surface. Proper surface preparation is essential for a top quality paint finish. Incomplete or improper surface preparation is the primary cause of coating failures. Dirt, grease, mechanical defects of all types and old paint in poor condition are just a few of the things that contribute to early paint failures. All metal surfaces must be clean and free of rust, mill scale, grease, oil, dirt and other foreign matter. All of these materials will effect the life of the paint job. Metal surfaces contain minute pores which provide "tooth" for the paint film. When these pores are filled with any foreign matter, the paint is unable to adhere to the surface. When rust is not properly removed it will continue under the paint until it eventually breaks through causing failure. Cover and protect all surfaces that will not be painted. Sand all doors and frames. Patch and fill all holes and cracks. If deep cracks exist they must be cut out in such a way that they resemble an inverted V.
After the crack is cut out it must be cleaned thoroughly to remove dust and then soaked with water before any patching is done. (Soaking the old plaster with water prevents it from absorbing water from the new patch and causing crumbling). As a premier exterior painting contractor in the Ottawa area, we offer an extensive range of painting capabilities, re-painting experience, specialized exterior training and top-notch painting equipment and dedicated work force of painters. We provide superior quality exterior painting in Ottawa with the least inconvenience to our clients, which gives us an edge over our competition. 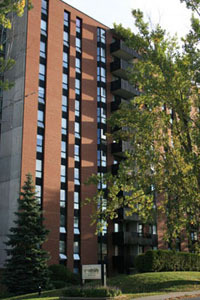 Our superior quality colours and craftsmanship livens up the interiors of apartments in Ottawa. Our repeat business underlines the reputation we enjoy with our clients. Choosing the right interior colours and shades, we create visual warmth in a property. We ensure that wall colours flow perfectly with the rest of the home and don't get distorted by natural or artificial lighting. The final product will reflect your personality and lifestyle.